This is a substantial solid stainless steel magnetic bracelet. It has brushed silver links with shiny 18k gold on the inside, and is substantial at about 1/2" wide. 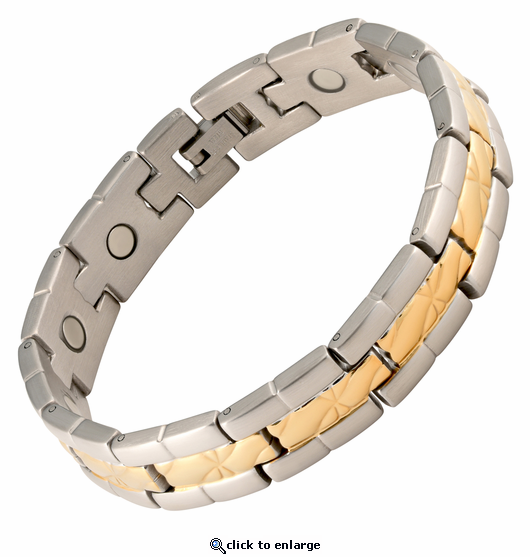 , This magnet bracelet has a 3300 gauss neodymium rare earth north facing magnet in each link. I bought this for my husband after he lost the one he had for years. He loved this one. Looks great! Fast shipping! Bought this for my husband.He loves it.Great value and service. This is my first order with this company and I was a little hesitant. However, time has proven that you are a VERY reliable company. I will order from you again and I will also highly recommend you to my friends. The gold coloring on the bracelet is not very true to color. The last one I purchased from you the colors were very good looking this one is not.Reply by MJS: We have not changed the 18 kt gold color. We are glad to help with exchange or whatever will make you happy. This is the 2nd one that I ordered mostly because the clasp/fastener was failing but that was after a couple of years of everyday wear. You realize after just a couple of days that the little aches and pains you might have in knees/hips are gone when you get out of bed in the morning. It also is the same colors as a watch I wear on the other hand so it is also a great accessory. The bracelet did much more then I could have ever thought it would. I don't believe it could stop the pain .not only that but it also stop the swelling. thank you so so much. I have spent a lot of money on doctors who could not do what that bracelet did. I cant thank you enough!! This is the second one I have bought. I was diagnosed with lymphedema and the magnetic bracelet has definitely decreased the swelling. At the price I would recommend you give it a try. The best thing you can do for yourself,purchased two for friends and they realized the difference in a couple of days,all one needs to do is ware it for a week then take it off for a day. Bet you don't go the whole day without! Best thing I ever purchased. Wish I had it years ago! I ordered 2 bracelets and an anklet. They arrived promptly. I loved the look and design of my anklet and my husband and son really liked the mens bracelets I got for them. Within hours of receiving my order I ordered another bracelet for another one of my sons...he liked it as much as we liked ours. I will definitely be ordering again in the near future. So far so good very comfortable would like to order another. First I love the styles you have to offer. I really like my bracelet and as I work with my hands in water the stainless steel was a plus for me. I would give it a strong 3. Works very well, I can do things I could not do for years. Took it off one night and forgot to put it back on the next morning, started to finish a project in the garage. Could not figure out why I was having pain in my wrist until I realized I hadn't put the bracelet back on. put it on and pain was immediately lessened. The Bracelet is awesome, looks great and at times I forget it is on my wrist. I receivced it in the time frame they gave me,the size was perfect an the quality an beauty of this bracelet is wounderful i wear it every day an all day.cant say if its helping with my knee pain just yet, but either way i love and i will order from this website again soon...thank you for the great service an product..
Hi, Great bracelets ! I have two now. Get compliments on both. My first was all stainless color, very solid feel, it gets a 5. My latest purchase was gold and stainless, beautiful but not made to the close tolerances as the all stainless. So it gets a 4. It rattles around a little. Reply by MJS: Sounds like maybe you have the wrong size? We are glad to re-size if you wish. This was a very good buy and would purchase it again in a heart beat. Absolutely Love this bracelet. I thought I had lost my other one which I had had for over 15 years. So I ordered this one which was a different style. I love it, but should have been the next size smaller. It is a little big, but I wear it to work. Have had alot of compliments on it. Reply By MJS: We are glad to re-size for you if you wish. The bracelet looks and feels great. Thanks for the quick service. Hope you enjoyed your vacation. My son loves this bracelet, it is his third one and having carpal tunnel they make a world of difference in his wrist pain. He also loves the looks of it and has many compliments on it. He never takes his off and they never tarnish always look like new.Service was fantastic also. I bought this as a gift for my mom. She just loved it and says her wrist feels better! The bracelet was beautiful and the service was awesome! Worth the price! This is a great 2 tone bracelet. Love it. Excellent Service. Ordered it on a Friday night and had it Monday afternoon. Sized correctly. Very happy. I was excited until I saw the appearance of the bracelet. I was a bit disappointed because it is more like a watch band, and the silver appears to be a light charcoal gray instead of what i think silver to look like. One thing though, I sleep on a magnetic mattress pad and the bracelet must come off at night because it does have sufficient strength enough to cause a headache. (Which did subside seconds upon removal of the bracelet). Reply by MJS: The bracelet is the one shown in the picture. The silver style is matte silver as we state in the description. We are glad to exchange or refund if you wish. I ordered this braclet after a friend of mine let me try his out for a couple days. He insisted I try his and I would definitely see how great it works. He was right, my joint pain in my hands was gone. I immediately went online and ordered one. What a great product! Thanks for making my life so much better. He loves it and the service was awesome! Not only do I like the look of the bracelet but my right hand functions about 60% better then it did before I had the bracelet. This is important to me because I'm 75 yrs. young and play tennis 4 times a week. I love the fact the bracelet does not tarnish. I have being wearing for three weeks now and it still looks as shiny and new as the day I received. I would like to purchase a stainless steel ring. YOU PEOPLE ARE DOING A GREAT JOB! I RECEIVE DAILY COMPLIMENTS ON THE JEWELRY. I HIT SIX BUCKETS OF GOLF BALLS TODAY. UNHEARD OF AT AGE 62., I THINK THE BRACELETS (WORE TWO) HAVE ME THAT SPECIAL REVITALIZING CHI CIRCULATING! THANKS AGAIN. It is beautiful and well worth the money. It works great and so happy I have one. Very nice and well put together. Excellent bracelet. Sized perfectly and looks great. Excellent, fast service and my husband is pleased.